I approached the passenger side door and immediately smelled the strong odor of alcoholic beverages coming from his car. He related that he is a news reporter for NBC News and had just met with attorney Joe AMENDOLA about the Jerry SANDUSKY case. His eyes were glassy. I asked how much alcohol he had consumed and he told me intially, "Two beers." He related that one was an Otto's Red something. His speech was slurred and he juxtaposed the letters in a few words. He also related that he takes an anti-depressant prescription drug but did not know the name. He thought it started with a "C." He explained that he had been using his cell phone and that is why he was all over the road. He performed poorly on SFST and even used his right hand against his car for balance on WAT. I continued to smell the strong odor of alcoholic beverages upon his breath as I administered SFST. I arrested him and took him to Mount Nittany Medical Center for a blood test. He pleaded with me initially not to do it this way. BAC results received on 12/13/11 showed a .182% BAC. 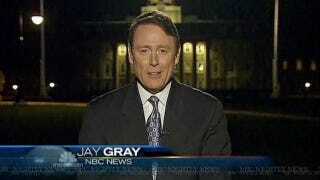 It has since been reported that NBC took Gray off the Penn State story, but the network has not confirmed this. An email to an NBC publicist has not been returned.